Peytoia, previously known as Laggania, is an anomalocarid from the Cambrian Period that has only one species, P. nathorsti (formerly L. cambria). Charles Doolittle Walcott first classified Peytoia as a holothurian (sea cucumber), but later scientists classified it as an arthropod. 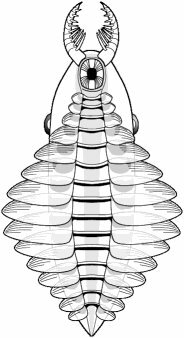 Unlike it's relative Anomalocaris, Peytoia was probably a filter feeder. Its eyes were further down the head than Anomalocaris's eyes. It was also much smaller than Anomalocaris, about half a meter long. 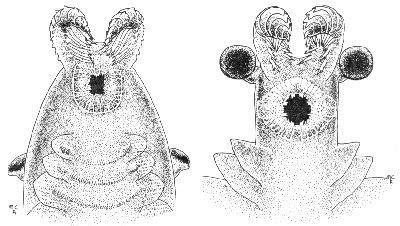 In this image, P. nathorsti is on the left and Anomalocaris canadensis is on the right. Peytoia probably swam by flapping its lobe-like side fins, but it was probably not as fast as Anomalocaris because it did not have a fan tail to propel it through the water. Peytoia's head was much larger than Anomalocaris's head, and the body of Peytoia was also a lot more bulky than Anomalocaris. Peytoia's claws had different types of spikes. At the front of the claws, the spikes were short and stubby, and at the back of the claws, they were long and paddle-like, possibly for filtering food into the mouth. I wonder if its claws evolved this way because a filter feeder like Peytoia would not need sharp claws and it would only need paddles close to the mouth. Note: Post updated on May 26, 2012 to reflect name change of the species. If Anomalocaris ate a Laggania, would it go 'Scrunch'?